The Firebase Cloud Messaging Android Quickstart app demonstrates registering an Android app for notifications and handling the receipt of a message. InstanceID allows easy registration while FirebaseMessagingService and FirebaseInstanceIDService enable token refreshes and message handling on the client. NOTE: This sample contains identical code for both Java and Kotlin. However, there can only be one service in each app that receives FCM messages. If multiple are declared in the Manifest then the first one will be chosen. Use Firebase console to send FCM messages to device or emulator. From Firebase console Notification section, click New Message. Enter the text of your message in the Message Text field. Set the target to Single Device. 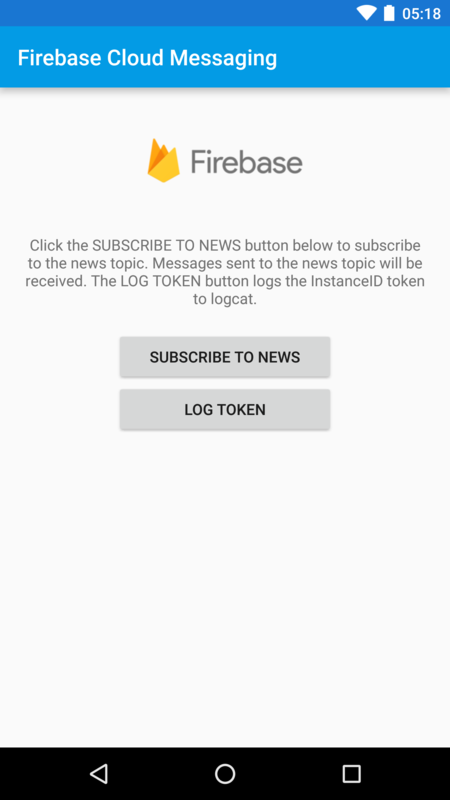 Check the logs for the InstanceID token, copy and paste it into the Firebase console Token field. If you cannot find the token in your logs, click on the LOG TOKEN button in the application and the token will be logged in logcat. If your application is in the foreground you should see the incoming message printed in the logs. If it is in the background, a system notification should be displayed. When the notification is tapped, the application should return to the quickstart application. Click on the SUBSCRIBE TO NEWS button to subscribe to the news topic. Set the target to Topic. Select the news topic from the list of topics ("news" in this sample). You must subscribe from the device or emulator before the topic will will be visible in the console. If incoming FCM messages do not specify an Android notification channel, you can indicate to FCM what channel should be used as the default by adding a metadata element to your application manifest. In the metadata element specify the ID of the channel that should be used by default by FCM. Note: You are still required to create a notification channel in code with an ID that matches the one defined in the manifest. See the Android docs for more. Setting a custom default icon allows you to specify what icon is used for notification messages if no icon is set in the notification payload. Also use the custom default icon to set the icon used by notification messages sent from the Firebase console. If no custom default icon is set and no icon is set in the notification payload, the application icon (rendered in white) is used. You can also define what color is used with your notification. Different android versions use this settings in different ways: Android < N use this as background color for the icon. Android >= N use this to color the icon and the app name.